How vital it is for the believer to rightly divide the Word of Truth. God has a plan for Israel and God has a plan for His Body, the Church.. and He has a plan for those in the tribulation and one for those in the millennium – and His overall plan and purpose is to bring everything into Christ. The plan of God is laid out in the scriptures from Genesis to Revelation and the Christian needs to seek and see where he is in God’s plan and time-line. Moses, the Jews, the Law and the Prophets all came before the cross.. teaching the good news of the coming Messiah and His coming kingdom rule. And Israel was chosen as God’s people and given the Law and the Prophets.. but they disobeyed as a nation and God had to set Israel aside for a period. The standard of the Law was perfect but impossible for Israel to achieve. The Law is a schoolmaster to show that we cannot be righteous of ourselves. The Law is a teacher to point us to Christ – to show us the way and to point to truth, but many in that period of Law found GRACE in the eyes of the Lord.. for many in that period of Law BELIEVED the Word of the Lord – and many were made righteous in Christ – as recorded in Hebrews chapter 11. Then Christ was born and the four gospels announced to Israel – your King is here. Israel’s long waiting for their King and His long promised Kingdom had arrived, and the Gospel of the Kingdom was preached to the lost sheep of the house of Israel – and Israel as a nation was to believe on the Son of Man – repent and be baptised as recorded in Holy writ. And the life that Christ lived was a life lived under the Law. And the life that Christ lived was a perfect life, an exemplary life, the perfect standard.. so that He could be the perfect sacrifice – to save His people, Israel, from their sins. 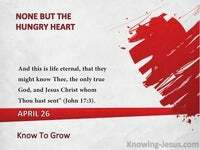 And then the cross, the rejection, and Israel had her king crucified.. and the kingdom of heaven was taken away.. and given to a people that would bring forth the fruit thereof. Matthew 21:43 The Church was created to bring forth the fruit that Israel failed to produce. But Israel is Israel and the Church is the Church: and God has a plan for the nation of Israel and God has a plan for His body, the Church.. and He has a plan for those in the tribulation and one for those in the millennium – and His overall plan and purpose is to bring everything into Christ. It is also vital also to rightly divide between justification and sanctification. 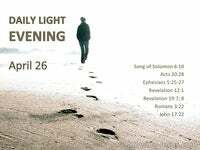 1) Justification – the salvation of the spirit : born into the family of God. 2) Sanctification – the salvation of the soul : living as a child of God. 1) Justification – born again once and in eternal union with Christ forever. 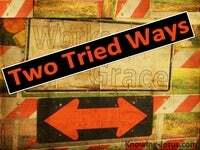 2) Sanctification – growing in grace throughout life. The bible rightly divides between justification and sanctification. Then come the Acts, which records a unique time of transition.. a passing of the baton from Peter to Paul.. change of God’s focus from Israel to a focus on the Church.. change from the dispensation of Law to the dispensation of the Church – a change from the gospel of the kingdom to the gospels of God’s grace and glory. God gave Israel rules to follow through Moses : the Mosaic Law was the law of death. God also gave the Church rules to follow through Paul: Christ’s law of life and liberty. 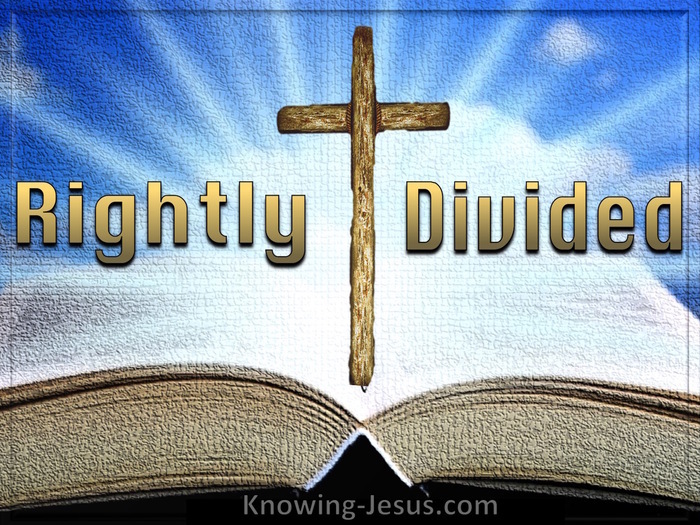 Oh yes – The Christian needs to rightly divide the Word of Truth. But in the meantime the mystery of the Church is given through Paul to us. 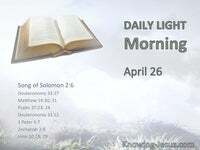 See Romans : Corinthians : Galatians – justification : sanctification : glorification – and we discover that the church is not under the Law but under grace. Christ’s death, burial and resurrection gave birth to a new creation in Christ.. and the gospel of grace is unlocked by Paul, for all who are His body, the Church. Ephesians : Philippians : Colossians : Thessalonians : Timothy : Titus : Philemon.. And the law of life and liberty and the new creation becomes an unveiled mystery.. Christ’s body becomes bone of His bone and flesh of His flesh – a spiritual body. Our bodies become the temple of the Lord – through the indwelling Holy Spirit and we find we have a position in Christ and are now seated in heavenly places – we discover we are to be the bride for the Son – without spot and wrinkle. The old Adam is crucified and the New Man is being conformed into His image. Through a life of tribulation we at last come to a glorious heavenly inheritance.. as the gospel of the grace of Christ starts to be unfolded – and the gospel of the glory of Christ through Paul and others is also unfolded. 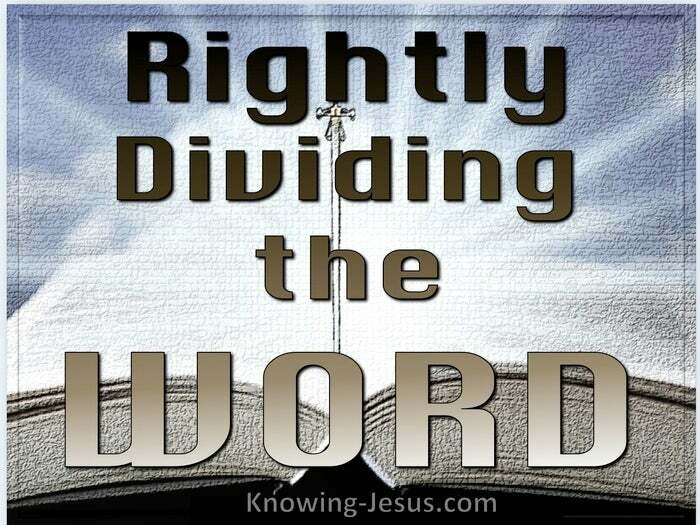 Oh yes – the Christian needs to Rightly Divide the Word of Truth.